Throughout Earth's history there have been five major and several lesser Extinction Events. These extinction events concern the sudden disappearance of many species. The most 'infamous' event was the extinction of the dinosaurs at the end of the Cretaceous (65 million years ago). The fossil record shows that many life forms, with different body plans from those seen in living phyla, evolved and subsequently became extinct during the Precambrian and Cambrian periods, representing possibly over 100 phyla not alive today. 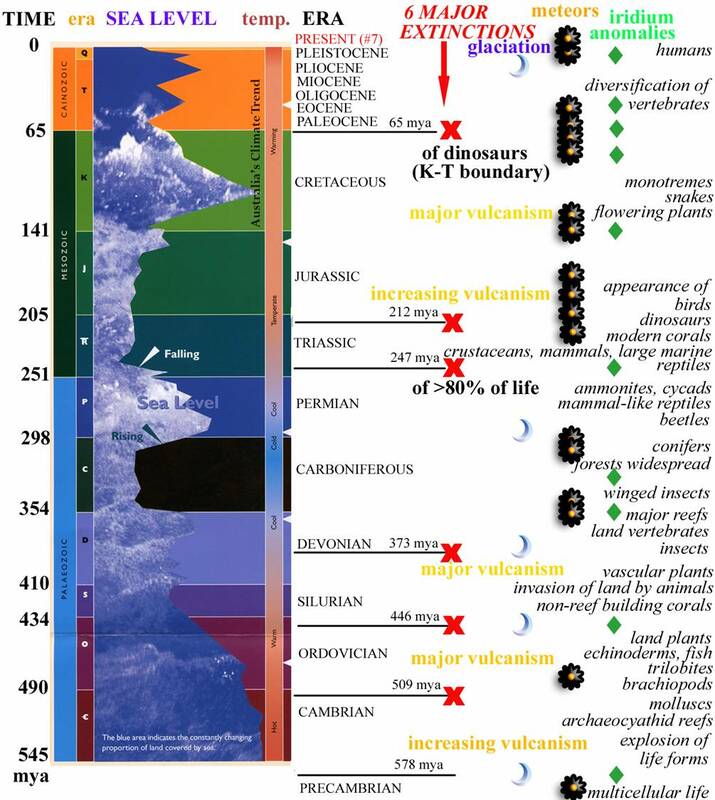 Geological time line and extinction events (161 KB) over Earth's history. We now face 'The Sixth Extinction' event. This new event differs significantly from the others that were caused by catastrophic natural disasters or gradual changes to Earth's chemistry and physical topography. It is different because it is happening over a very short period of time, within time scales of decades, not millennia, and it is a direct result of one species substantially modifying the planet at the expense of the other 11 million or so species. That species is us. At the current rate of habitat destruction it is estimated that within the next 100 years or so about half of the world's existing species may be extinct, and this does not include the countless thousands of species we have already made extinct. Man's impact on the environment has been, and continues to be, catastrophic. The rate of species loss during this, 'The Sixth Extinction', is estimated to be somewhere between 100 and 1000 times greater than during any previous Extinction Events. Irrespective of the huge technological advances made in science, we cannot replicate or recreate nature's bounty. Extinction is fundamentally a one-way street!